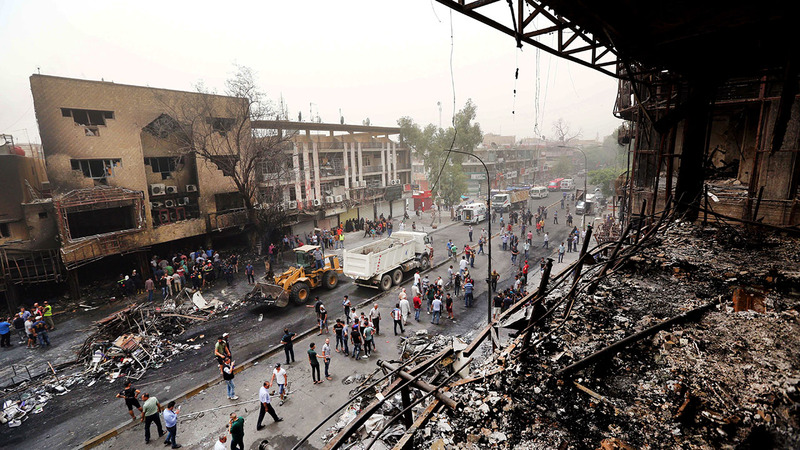 BAGHDAD -- A suicide truck bomb in downtown Baghdad killed 115 people and wounded nearly 200 others who were out shopping and celebrating early Sunday ahead of the holiday marking the end of Ramadan, security and medical officials said. Karada is a major commercial area lined with clothing and jewelry stores, restaurants and cafes, and was packed with shoppers ahead of Wednesday's Eid al-Fitr holiday marking the end of Ramadan. Most of the victims were inside a multi-story shopping and amusement mall, where dozens burned to death or suffocated, police said. As with many previous attacks, IS swiftly claimed responsibility for the bombing in a statement posted online, saying it had targeted Shiite Muslims. The Associated Press could not verify the authenticity of the statement, but it was posted on a militant website commonly used by the extremists. Elsewhere in Baghdad, a roadside bomb went off in the mostly Shiite Shaab neighborhood, killing five people and wounding 16, another police officer said. No group claimed responsibility for the attack, but it bore the hallmarks of IS militants. The Sunni extremists frequently target the country's Shiite majority and Shiite-led security forces, viewing them as apostates deserving of death. The attacks came just a little over a week after Iraqi forces declared Fallujah "fully liberated," marking a major victory against IS. The city, less than an hour's drive from Baghdad, had been the first Iraqi urban center to fall to IS, in January 2014, and was its last major stronghold in the vast, Sunni Anbar province. Mosul, Iraq's second-largest city, fell to IS when the militants swept across northern and western Iraq in the summer of 2014. It is the largest city in the group's self-styled caliphate. Hours after the Baghdad bombing, Iraqi Prime Minister Haider al-Abadi and lawmakers visited the blast site. Video footage uploaded to social media showed an angry crowd, with people calling al-Abadi a "thief" and shouting at his convoy. Eyewitnesses said the crowd pelted al-Abadi's car with rocks, shoes and jerry cans. "We are in a state of war, and these places are targeted. The security can't focus on the war (against IS) and forget Baghdad," Sami, the street vendor, said. "These attacks only strengthen our resolve to support Iraqi security forces as they continue to take back territory from ISIL, just as we continue to intensify our efforts to root out ISIL's terrorist network and leaders," National Security Council spokesman Ned Price said in a statement, referring to IS by an alternative acronym. At the height of the extremist group's power in 2014, IS rendered nearly a third of Iraq out of government control. Now, the militants are estimated to control only 14 percent of Iraqi territory, according to the prime minister's office.